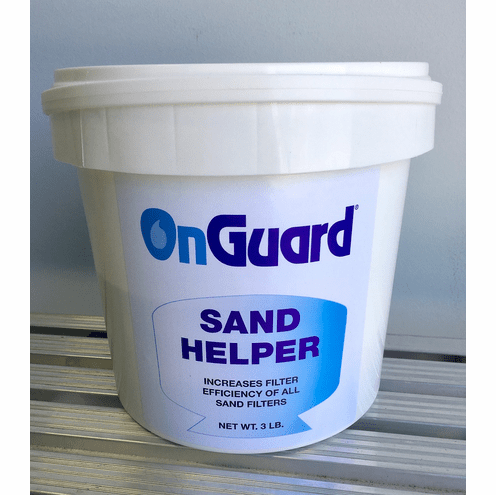 Sand Filter Helper will Dramatically Improves Filtration in sand filters resulting in Increase Water Clarity Have SUPER CLEAR POOL WATER by a simply adding a cup or two of this product through your pool skimmer (with pump running) will dramatically improve the quality of your swimming pool sand filter by increasing the density of the filtration system. Prevents organic materials such as suntan lotion, body oils, and hair lotions from clogging up your filter. Sand filter helper is a natural micro-cellulose fiber that give yours pool sparkling clear pool water. Can be used in all filter systems. Sand & Cartridge. Has natural absorbent properties that help remove discoloring minerals such as iron and copper, and absorbs unsightly lotions and oils from the water. NOTE: For best results leave Sand Filter Helper in your pool filter until the water flow returning back to your pool is 50+% weaker than after a backwash.